Installing a security or fire alarm system with monitored remote signalling ensures that your property is protected, 24 hours a day 365 days a year. Should your alarm be activated, either you, a nominated key holder or one of the emergency services will be informed immediately. Paragon Fire and Security Systems provide this 24-hour remote monitoring service for the remote signalling systems we install and maintain throughout London and the South East. 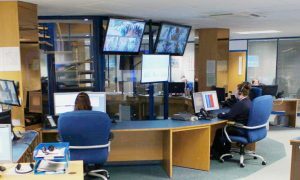 Our ARC (alarm receiving centre), is Southern Monitoring, the largest independent ARC service and largest independent RVRC service in the UK, monitoring over 1,500 alarm installers’ systems. The signalling units we install range from basic digital communicators through to ultra-secure dual path systems. We partner with two of the largest manufacturers of remote signalling, BT Redcare and CSL. Following a consultation, we will recommend the best system for you depending on your premises, budget and requirements. CSL Dual Com Digi Air is a great option for when there is no phone line available as it signals over a mobile network. BT RedCare GSM is ideal for properties at higher risk as the phone line is monitored and if the line is cut or fails an alert is sent to the alarm receiving centre, but it continues to send messages over a mobile network. If police response is not required a single path signalling device is sufficient. A single path signalling device is allowed for police response but certain conditions must be written into system design proposal. Paragons’ fully qualified fire and security engineers install your recommended alarm system and fit the communication device, either inside the alarm panel or on a separate power supply. The alarm communicator is capable of sending a coded message for a number of activations or faults. As engineers we refer to these as Pins. For further information on any of the above, or an alarm system quotation, contact us or call us on 01483 724484.